★Tai One On: Lofi-Lobo returns from his #TaiChi sabbatical to discuss his new powers and abilities related to the ancient martial art. ★Faking The Funk: We explore some interesting facts about sense of smell, body odor, pheromones, and asparagus pee. ★Interracial Adoption: Fact: Black babies cost less to adopt, but are there hidden costs when white parents scramble to adopt children of color? ★Layers: Royce Da 5’9″ retweeted Beat*Shot Radio last night, just in time for our review of his latest album, #Layers. ★I Love Hue: We examine #interracial #dating and the various pressures pushing people to date inside and outside their own race. ★Week Recap: Last week in the #518 there was a lot going on. From holidays, to babies, to court cases, to weddings, to rap shows, and more. We recount some of the highlights. 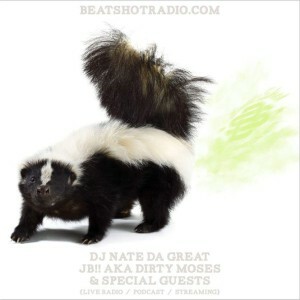 ★Don’t Google That: We reprise one of our classic segments for tonight’s smelly edition of Beat*Shot Radio!